Combine sliced cucumbers and salt in a large, shallow bowl; cover and chill for 1 – 1 ½ hours. Place cucumbers in a colander and rinse thoroughly under cold water. Drain well, and return to bowl. Add sliced onion to the bowl and toss with cucumbers. In a small saucepan over medium heat, whisk together xylitol, white vinegar, apple cider vinegar, coconut palm sugar, mustard seeds, celery seeds and turmeric. Bring to a simmer and whisk until sugar dissolves (about 5 minutes). Pour hot vinegar mixture over cucumbers. Let stand at room temperature for 1 hour. 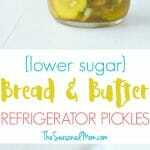 Place pickles (and liquid) in airtight container or jars and refrigerate for up to 2 weeks.